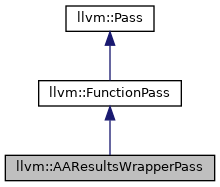 A wrapper pass to provide the legacy pass manager access to a suitably prepared AAResults object. Definition at line 1152 of file AliasAnalysis.h. Definition at line 743 of file AliasAnalysis.cpp. 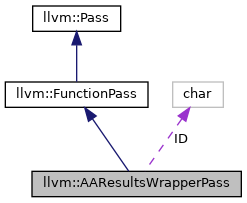 References llvm::PassRegistry::getPassRegistry(), ID, INITIALIZE_PASS_BEGIN(), INITIALIZE_PASS_DEPENDENCY, and llvm::initializeAAResultsWrapperPassPass(). Definition at line 1160 of file AliasAnalysis.h. Definition at line 1161 of file AliasAnalysis.h. Definition at line 819 of file AliasAnalysis.cpp. References llvm::AnalysisUsage::addRequired(), llvm::AnalysisUsage::addUsedIfAvailable(), and llvm::AnalysisUsage::setPreservesAll(). This is the legacy pass manager's interface to the new-style AA results aggregation object. Because this is somewhat shoe-horned into the legacy pass manager, we hard code all the specific alias analyses available into it. While the particular set enabled is configured via commandline flags, adding a new alias analysis to LLVM will require adding support for it to this list. Definition at line 775 of file AliasAnalysis.cpp. Definition at line 1156 of file AliasAnalysis.h.